Stay N Abroad: A Mom's Must Have Book for Road Trips--Rand McNally's Are We There Yet? 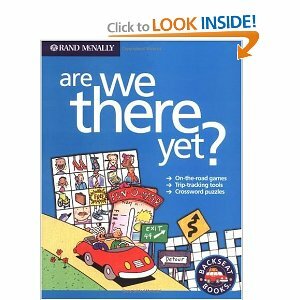 A Mom's Must Have Book for Road Trips--Rand McNally's Are We There Yet? Road Trips with children can be stressful, I mean eventful. We were in the car a mere thirty minutes before our seven-year-old asked the infamous question, "Are we there yet?" My favorite car boredom busters that don't require a plug or batteries is the backseat book series by Rand McNally. For the older crowd, ages 7-11, Are We There Yet? is an amazing book filled with puzzles, games, songs, mazes, mini-mysteries, crosswords and more. This book is challenging and lengthy enough to fill several hours. After completing most of the book, our children insisted on keeping a copy just for the song lyrics which are now a tradition on any trip that takes longer than 45 minutes. For the younger group, ages 4-8, Best Travel Activity Book Ever is filled with simpler puzzles, mazes, coloring pages, dot-to-dots, and games. Pass the crayons, please. Our then five-year-old could not finish this thick book during our vacation and enjoyed doing the harder mazes throughout his kindergarten year on rainy days. 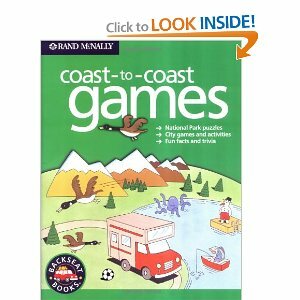 Currently harder to find is Coast to Coast Games, aimed at ages 6-9. This is also a very engaging book with a good dose of geography and riddles mixed in with puzzles and games. For a road trip that covers several states, this would be a very good choice. It definitely showcases the diversity of America. Rand McNally also offers a Kids' Road Atlas. Though some parents may like this book, I find it far inferior to the other books and do not recommend it. As technology becomes more available and cheaper, I am always glad for an option that doesn't require a plug or batteries. I have found these books to be cheap (less than $5.00 on Amazon or eBay), and very engaging for my children (not to mention educational). A must have for any significant road trip. I can't wait to rent a van from the used car dealers long island garage and take the family out for a surprise road trip. This is a must-have for the little-too-excited toddlers, indeed. Our family usually do road trips every summer using the car we got through a loan. My wife bought some activity books in which our kids are using especially if we are stuck on a traffic situation.